The findings are significant, because temperature and rain and snow trends in the area impact on water availability for more than 50 million Pakistanis. Researchers focussed on the Upper Indus Basin, which is the mainstay of the national economy of Pakistan and has 170,000 sq km of irrigated land - an area two-thirds the size of the UK. 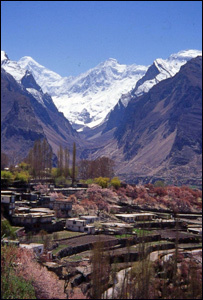 Dr Hayley Fowler, senior research associate at the university's school of civil engineering and geosciences, said: "Very little research of this kind has been carried out in this region and yet the findings from our work have implications for the water supplies of around 50 million people in Pakistan." Co-researcher David Archer added: "Our research is concerned with both climate change and the climate variability that is happening from year to year. "Information on variability is more important for the management of the water system as it will help to forecast the inflow into reservoirs and allow for better planning of water use for irrigation. "However, information on the impacts of climatic change is important for the longer term management of water resources and to help us understand what is happening in the mountains under global warming." The findings are published in the American Meteorological Society's Journal of Climate.